Astronomers are reporting a rare star as big—or bigger—than the Earth's sun that is expanding and contracting in a unique pattern in three different directions. The star is one that pulsates and so is characterized by varying brightness over time. It's situated 7,000 light years away from the Earth in the constellation Pegasus, said astronomer Farley Ferrante, a member of the team that made the discovery at Southern Methodist University, Dallas. Called a variable star, this particular star is one of only seven known stars of its kind in our Milky Way galaxy. "It was challenging to identify it," Ferrante said. "This is the first time we'd encountered this rare type." The Milky Way has more than 100 billion stars. But just over 400,900 are catalogued as variable stars. Of those, a mere seven—including the one identified at SMU—are the rare intrinsic variable star called a Triple Mode 'high amplitude delta Scuti' (pronounced SKOO-tee) or Triple Mode HADS(B), for short. "The discovery of this object helps to flesh out the characteristics of this unique type of variable star. These and further measurements can be used to probe the way the pulsations happen," said SMU's Robert Kehoe, a professor in the Department of Physics who leads the SMU astronomy team. "Pulsating stars have also been important to improving our understanding of the expansion of the universe and its origins, which is another exciting piece of this puzzle." The star doesn't yet have a common name, only an official designation based on the telescope that recorded it and its celestial coordinates. 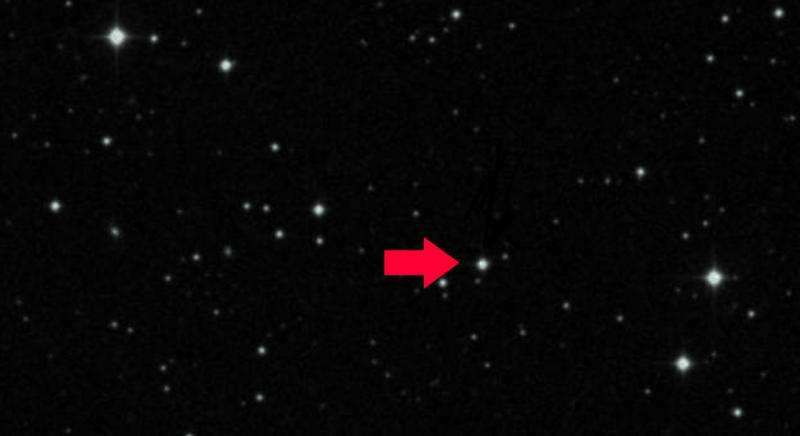 The star can be observed through a telescope, but identifying it was much more complicated. A high school student in an SMU summer astronomy program made the initial discovery upon culling through archived star observation data recorded by the small but powerful ROTSE-I telescope formerly at Los Alamos National Laboratory in New Mexico. Upon verification, the star was logged into the International Variable Star Index as ROTSE1 J232056.45+345150.9 by the American Association of Variable Star Observers at this link. How in the universe was it discovered? SMU's astrophysicists discovered the variable star by analyzing light curve shape, a key identifier of star type. Light curves were created from archived data procured by ROTSE-I during multiple nights in September 2000. The telescope generates images of optical light from electrical signals based on the intensity of the source. Data representing light intensity versus time is plotted on a scale to create the light curves. Plano Senior High School student Derek Hornung first discovered the object in the ROTSE-I data and prepared the initial light curves. 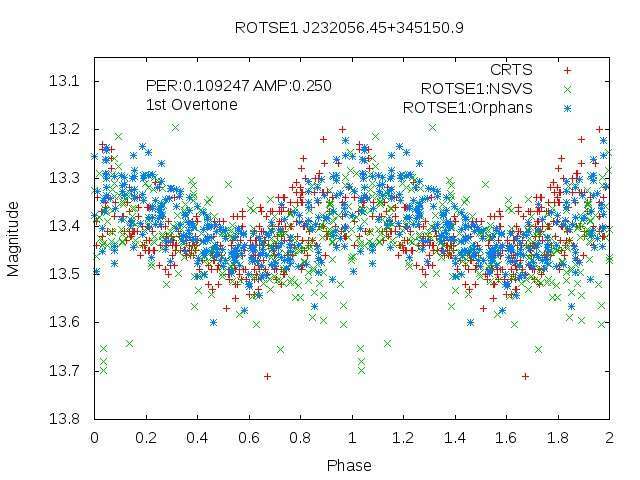 From the light curves, the astronomers knew they had something special. It became even more challenging to determine the specific kind of variable star. Then Eric Guzman, a physics graduate from the University of Texas at Dallas, who is entering SMU's graduate program, solved the puzzle, identifying the star as pulsating. "Light curve patterns are well established, and these standard shapes correspond to different types of stars," Ferrante said. "In a particular field of the night sky under observation there may have been hundreds or even thousands of stars. So the software we use generates a light curve for each one, for one night. Then—and here's the human part—we use our brain's capacity for pattern recognition to find something that looks interesting and that has a variation. This allows the initial variable star candidate to be identified. From there, you look at data from several other nights. We combine all of those into one plot, as well as add data sets from other telescopes, and that's the evidence for discerning what kind of variable star it is." That was accomplished conclusively during the referee process with the Variable Star Index moderator. The work to discover and analyze this rare variable star was carried out in conjunction with analyses by eight other high school students and two other undergraduates working on other variable candidates. The high school students were supported by SMU's chapter of the Department of Energy/National Science Foundation QuarkNet program. Of the stars that vary in brightness intrinsically, a large number exhibit amazingly regular oscillations in their brightness which is a sign of some pulsation phenomenon in the star, Ferrante said. Pulsation results from expanding and contracting as the star ages and exhausts the hydrogen fuel at its core. As the hydrogen fuel burns hotter, the star expands, then cools, then gravity shrinks it back, and contraction heats it back up. "I'm speaking very generally, because there's a lot of nuance, but there's this continual struggle between thermal expansion and gravitational contraction," Ferrante said. "The star oscillates like a spring, but it always overshoots its equilibrium, doing that for many millions of years until it evolves into the next phase, where it burns helium in its core. And if it's about the size and mass of the sun—then helium fusion and carbon is the end stage. And when helium is used up, we're left with a dying ember called a white dwarf." Within the pulsating category is a class of stars called delta Scuti, of which there are thousands. They are named for a prototype star whose characteristic features—including short periods of pulsating on the scale of a few hours—are typical of the entire class. Within delta Scuti is a subtype of which hundreds have been identified, called high amplitude delta Scuti, or HADS. Their brightness varies to a particularly large degree, registering more than 10 percent difference between their minimum and maximum brightness, indicating larger pulsations. Common delta Scuti pulsate along the radius in a uniform contraction like blowing up a balloon. A smaller sub-category are the HADS, which show asymmetrical-like pulsating curves. Within HADS, there's the relatively rare subtype called HADS(B) , of which there are only 114 identified. A HADS(B) is distinguished by its two modes of oscillation—different parts of the star expanding at different rates in different directions but the ratio of those two periods is always the same. For the SMU star, two modes of oscillation weren't immediately obvious in its light curve. "But we knew there was something going on because the light curve didn't quite match known light curves of other delta Scuti's and HADS' objects we had studied. The light curves—when laid on top of each other—presented an asymmetry," Ferrante said. "Ultimately the HADS(B) we discovered is even more unique than that though—it's a Triple Mode HADS(B) and there were previously only six identified in the Milky Way. So it has three modes of oscillation, all three with a distinct period, overlapping, and happening simultaneously." So rare, in fact, there's no name yet for this new category nor a separate registry designation for it. Guzman, the student researcher who analyzed and categorized the object, recalled how the mystery unfolded. "When I began the analysis of the object, we had an initial idea of what type it could be," Guzman said. "My task was to take the data and try to confirm the type by finding a second period that matched a known constant period ratio. After successfully finding the second mode, I noticed a third signal. After checking the results, I discovered the third signal coincided with what is predicted of a third pulsation mode." The SMU Triple Mode HADS(B) oscillates on a scale of 2.5 hours, so it will expand and contract 10 times in one Earth day. It and the other known six HADS(B)'s are in the same general region of the Milky Way galaxy, within a few thousand light years of one another. "I'm sure there are more out there," Ferrante said, "but they're still rare, a small fraction." SMU's Triple Mode HADS(B) is unstable and further along in its stellar evolution than our sun, which is about middle-aged and whose pulsating variations occur over a much longer period of time. SMU's Triple Mode HADS(B) core temperature, heated from the burning of hydrogen fuel, is about 15 million Kelvin or 28 million degrees Fahrenheit. Someday, millions of years from now, SMU's Triple Mode HADS(B) will deplete the hydrogen fuel at its core, and expand into a red giant. "Our sun might eventually experience this as well," Ferrante said. "But Earth will be inhospitable long before then. We won't be here to see it."